Do you have a passion for food... but are more interested in the business than in the cooking? Are you up to the challenge of managing the food service operations in America's restaurants, schools, businesses and health care facilities? In 2.5 years, through our year-round schedule, you can earn a Bachelor of Science Degree in Business Administration with a Concentration in Hospitality Management and have the skills and degree to be employed in the field. Management goes beyond monthly reports. A Hospitality Manager must be trained from the dish pit to the back office. 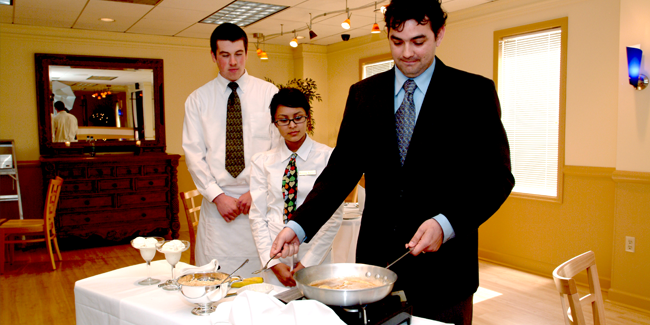 Our Bachelor of Science Degree in Business Administration with a Concentration in Hospitality Management integrates the fundamentals of culinary arts and food service operations with principles of management to prepare students to be successful in today's hospitality industry.